I arrived in Sirigiya in a pouring rain and lightning storm. It was 6:30pm and I had spent the past seven hours using a combination of buses and minivans to reach Sirigiya from Colombo's airport. I found a restaurant five minutes down the road from the hotel and order a local dish, Deviled Chicken. The chicken was normal chicken, nothing to fancy or succulent, but the vegetable and spiced sauce was on another level. I wish I was a goody to pinpoint sauce components, however, all I can say is I ordered a side serving of white rice because I thought it would have been inappropriate to drink the sauce from the bowl. The meal was completely un-Indian and hopefully a glimpse of the varied cuisine to come in future dining. 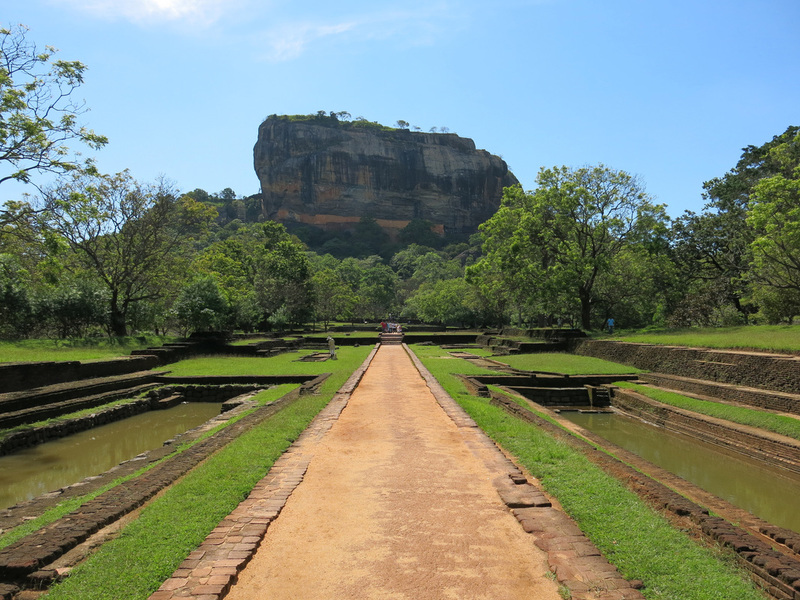 Sigiriya was a temporary royal palace structure built in the fifth century. Kasyapa stole the crown from the rightful heir, Moggallana. Fearing a retaliatory attack Kasyapa moved the capital south to Sirigiya. 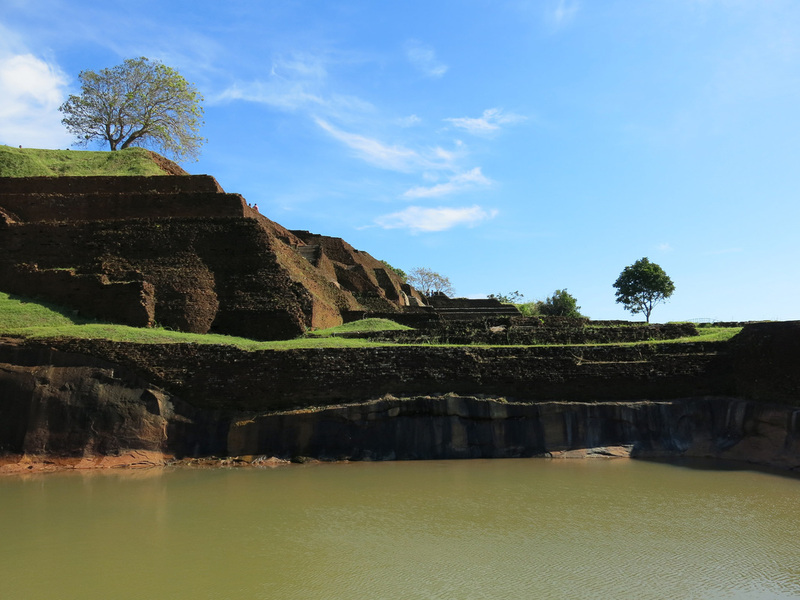 He constructed a palace complex on top a volcanic plug mountain that dramatically rises 200 meters above the surrounding landscape. Twenty years after losing the crown, Moggallana was successful in winning it back. 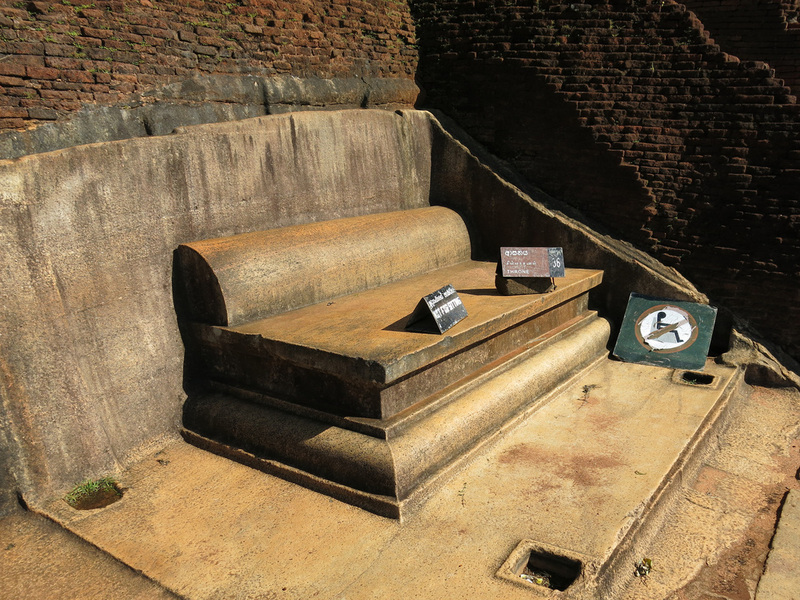 He returned the capital to Anuradhapura. 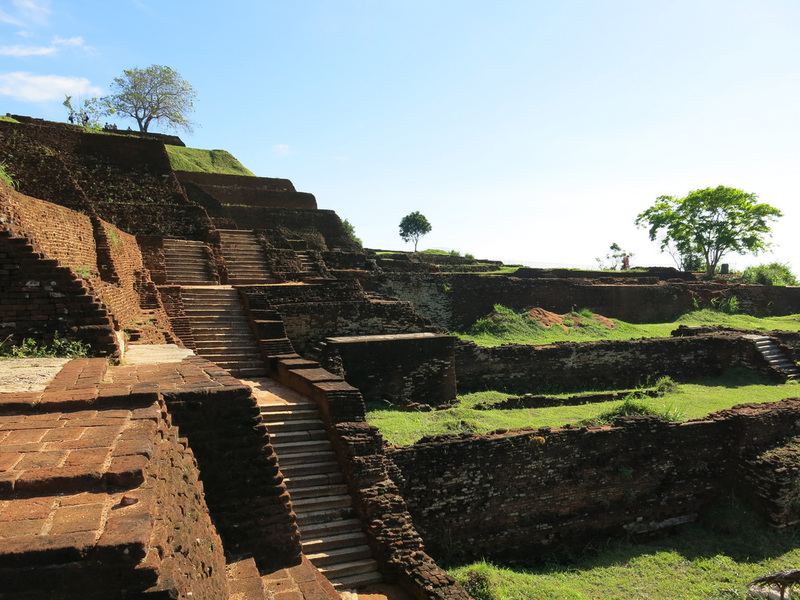 All that remains of Sirigiya today is the stone frameworks of the palace complex and the town below. There's a ridiculously steep entrance fee of $30 for foreigners. 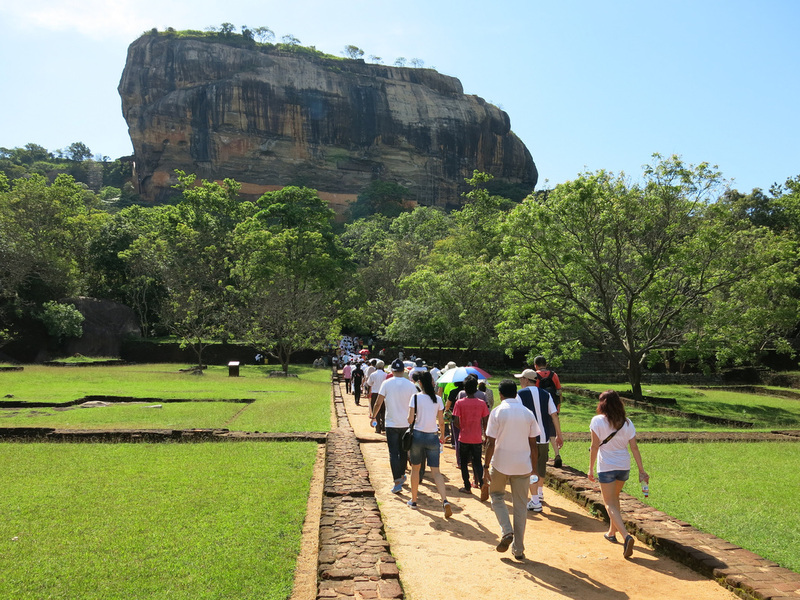 After entering the complex it took about an hour to reach the Sigiriya summit. It's not a strenuous climb, however, the heat ensured my shirt was thoroughly soaked through. 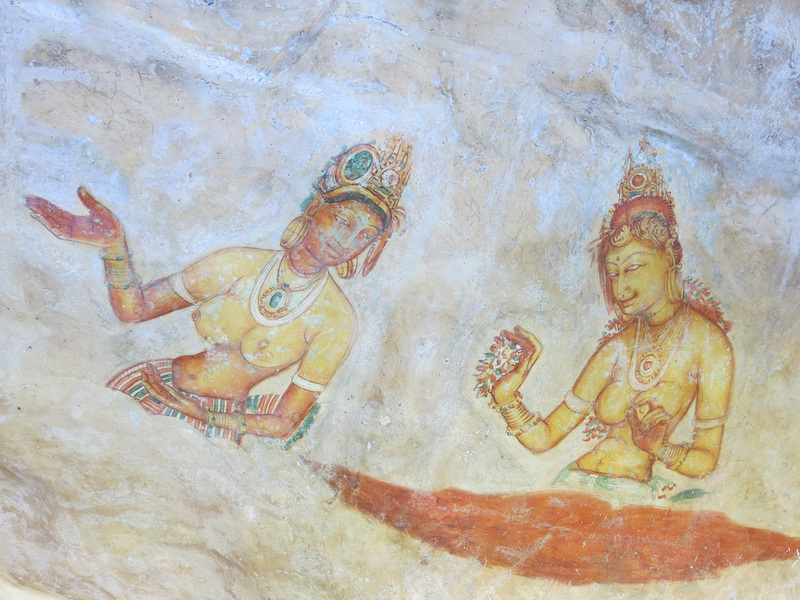 The climb up the summit passed through a section where frescoes were painted onto a protected section of rock. I have no idea if they've been recently retouched, although I will say it was good to be the king. 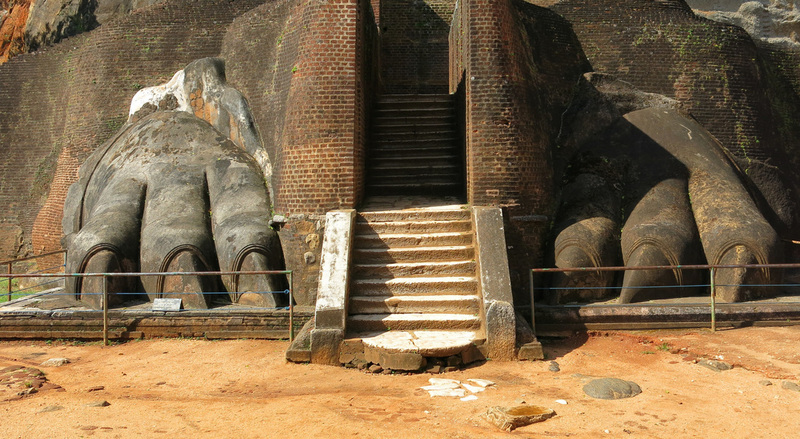 Further up the hike is the Lion Staircase. 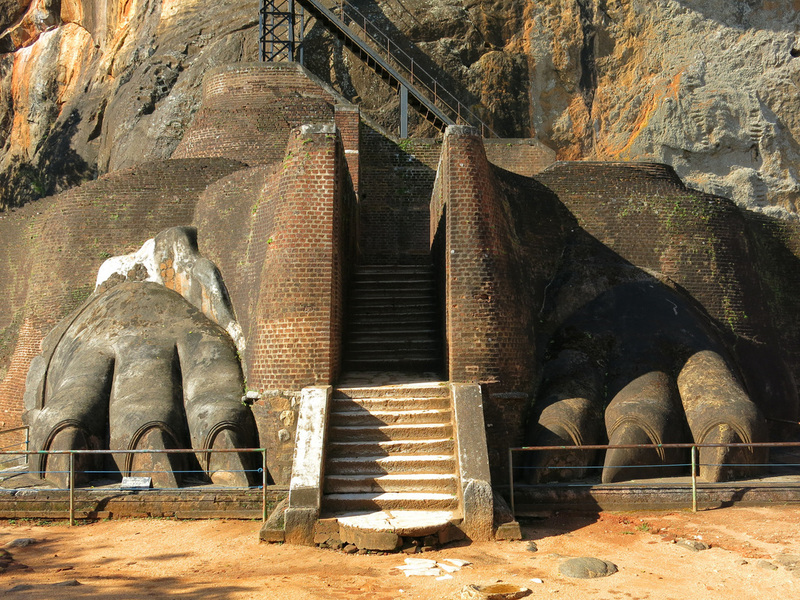 Two large lion paws, carved from the mountain, are on both sides of a staircase leading up to the palace complex. The palace complex covers most of the top of the peak. 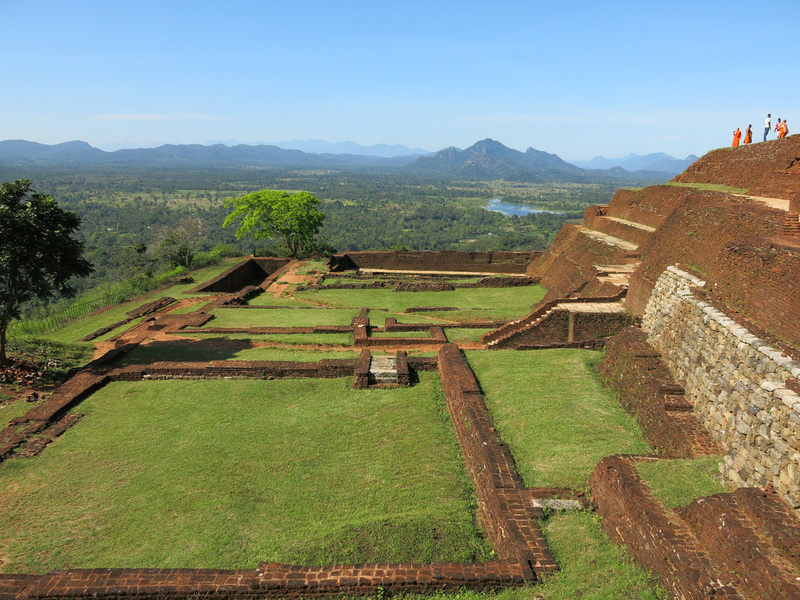 The palace itself is located at the highest point with the outline of several smaller buildings below. There's a pool and a throne. Given that I was on a peak it was difficult to take a photo that captures the complete complex, although it's not a huge, expansive area - maybe less than ten acres. The views from the peak were equally impressive looking out on the jungle below and the occasional peak rising in the distance. On the walk down I passed hundreds of people traveling in fifty person tour group packs. 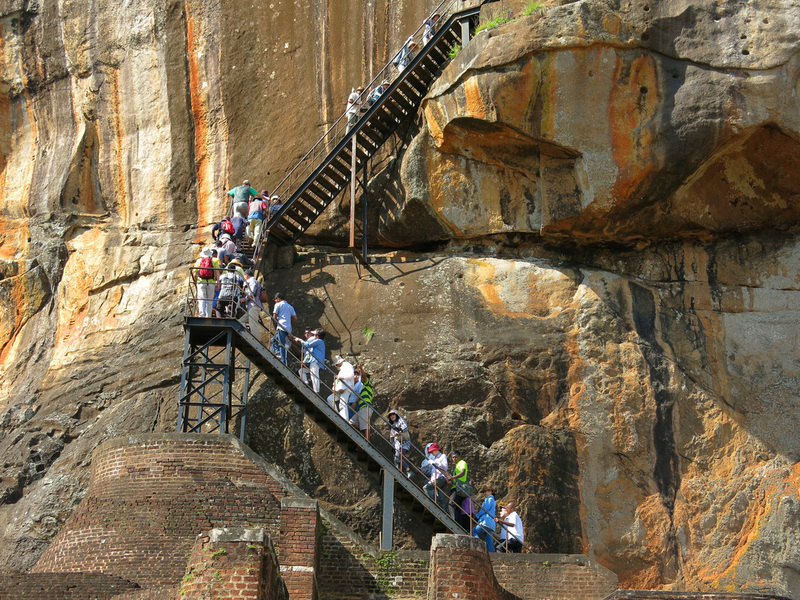 The Chinese are troopers when it comes to climbing stairs, however, I would not want to be stuck behind them on the single file line to the Sigiriya summit. There was also a 200 person group of students on a field trip. 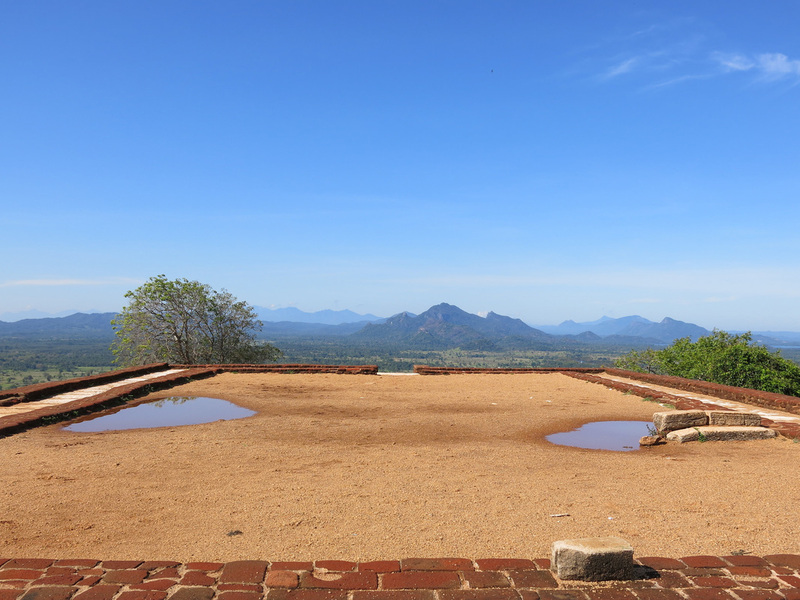 I was glad I slugged through the seven hour ride and spent the night in Sigiriya. I walked around the lower town area, checked out the museum (which contained a few sculptures and other artifacts), then returned to the hotel. I took a cold shower, changed my clothes, then caught a few more buses to Trincomalee to enjoy the best of Sri Lanka's beaches. 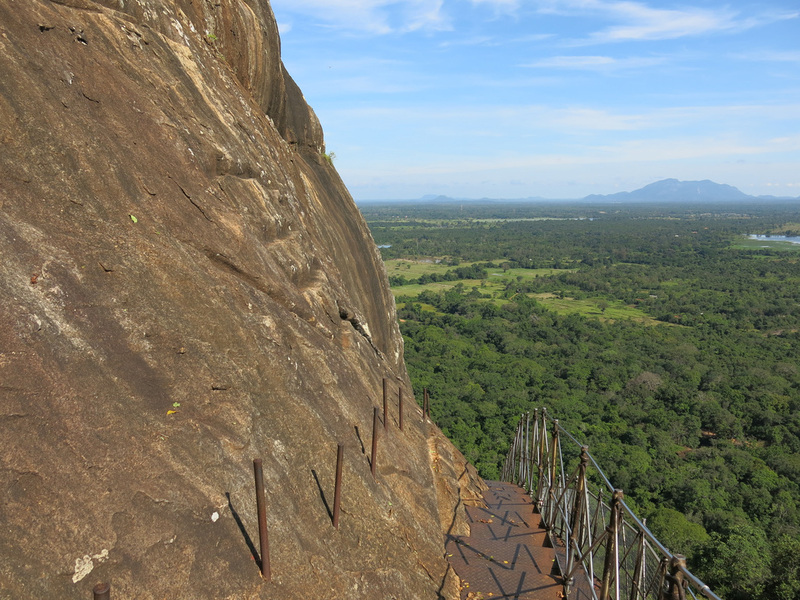 Visiting in the morning avoids the crowds, however, the sun rises in the east so it's not the best time for a photo of Sigiriya Rock from the base. 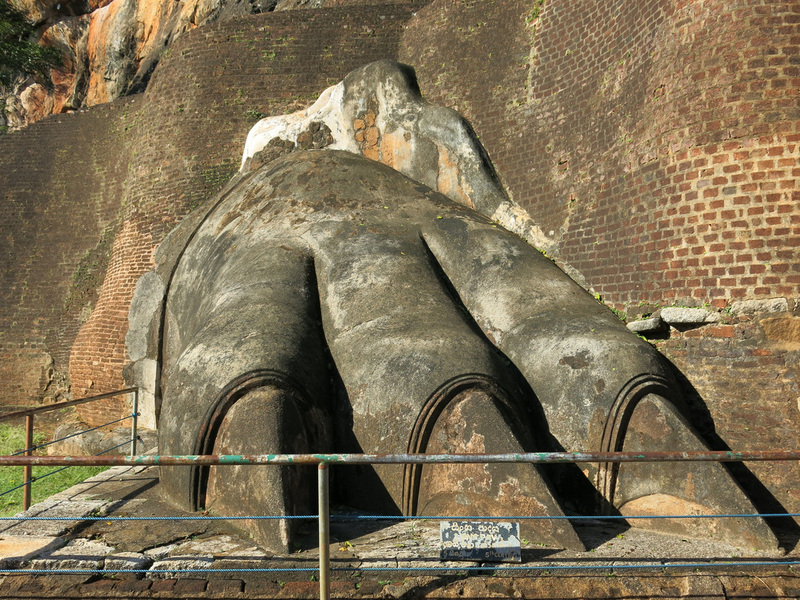 The Lions Claws and other areas have adequate sunlight. The site opens at 7am. I've seen it listed elsewhere as opening at 8:30am - that's when the museum opens. 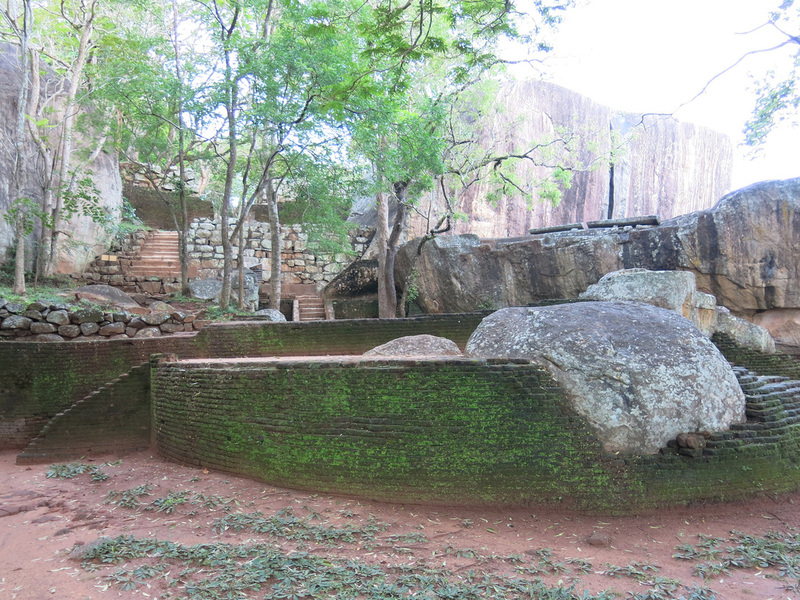 It was better staying in Sigiriya the night before, eating an early breakfast, then reaching the entrance when it opened. I did not spend much time at the lower town area. The exit is the same as the entrance, thus I passed everything on the way out and spent more time in the base area after summitting. I stayed at Lion Lodge. 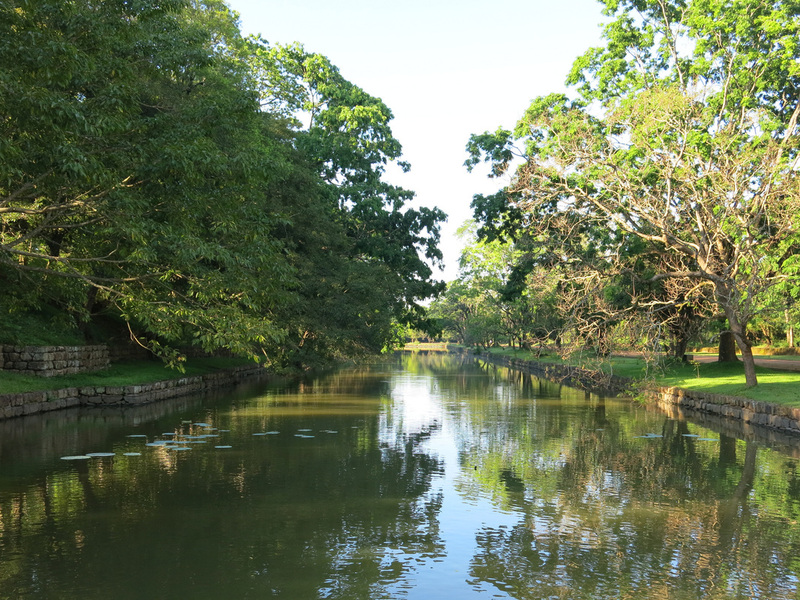 The bus driver knows where the hotel is and it's a five minute walk from the Sigiriya Rock turn off and fifteen minutes from the entrance. This area has seen an explosion of accommodation in the past two years. 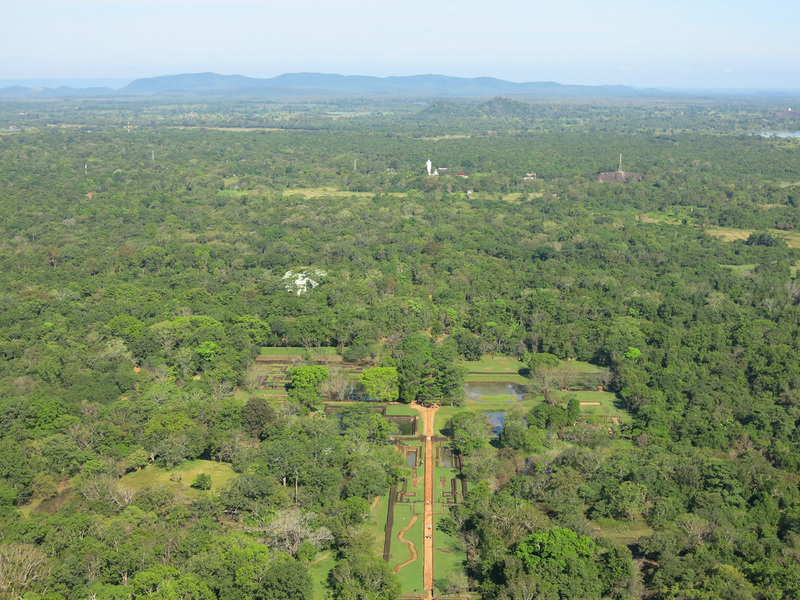 All hotel name's feature Sigiriya, Lion, or some combo of the two. I'd hesitate booking a room in advance - the online prices will be higher and it's a total crapshoot if the bus or a tuk tuk driver can find the location. 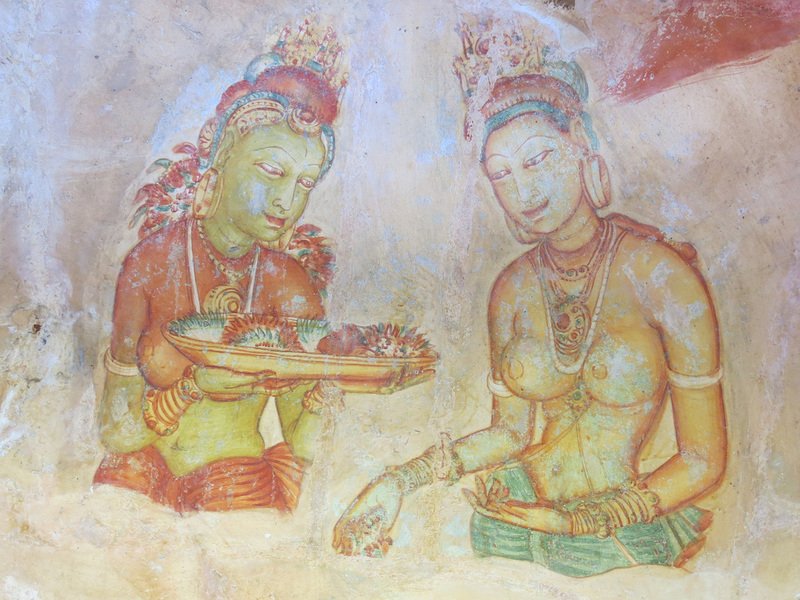 For additional Sigiriya photos see FLICKR ALBUM.